Finding out that you can always make constant improvements to your website will be music to your ears. That’s opposed to putting all of your eggs into one basket and failing to improve your website for years on end with the traditional web design method. The way in which the Growth Driven Design process focuses on continuous improvement is through genuine data and user behaviour. Obviously, there’s a difference between having that data and knowing what to do with it to implement necessary changes to your website. For that, you’ll need to integrate useful software into your tool stack so that you can analyse user behaviour. That’s where Hotjar comes in. It’s a tool that will help you truly understand your website visitors so you know exactly how your company can grow by eliminating the guesswork. Any website that’s created revolves around converting leads, that’s the end goal in the hope that they turn into promoters down the line. The only way that can happen is if your website solves their pain points which is why it’s vital that your website continuously improves. That means implementing wishlist items, changing design features and so on. That’s why using Hotjar gives you a much better idea of what needs to be changed or implemented because user behaviour is being analysed thanks to its features as it pretty much tracks everything. By using Hotjar, you have complete access to analytics and feedback in a single place, as opposed to purchasing different tools for each area. Luckily for you, this means you and your team can understand your visitors better and adjust your content and design like never before. Click on the points below to find out more about how each feature assists you in the GDD process. 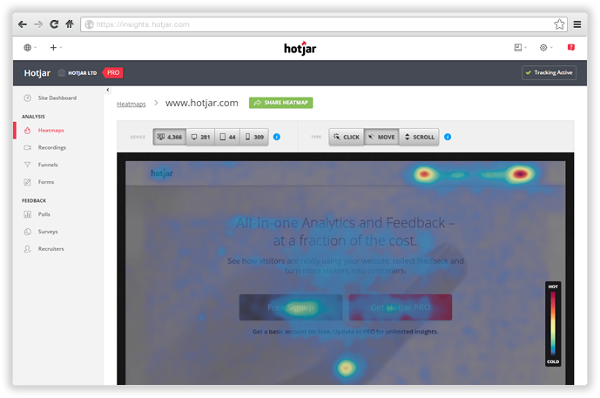 Hotjar Heatmaps can be used on pretty much any page of your website, even those password-protected ones you thought nobody could access. Without diving into the coding aspect of it and confusing everyone, the Heatmaps help you understand what your users want and care about. This is done by showing a visual representation of how they behave on your website depending on the type of Heatmap you implement. This includes things like clicks in certain areas, taps and even scrolling behaviour. Take a look at the example below. You’ll see a page covered in different colours but what this shows you is that the blue-y areas aren’t getting the most interest while the red areas are the ‘hottest’ on that particular page. How it Helps in GDD: It gives you a better understanding of what they like - which will be in red - and what they don’t notice as much in the blue areas. So, you can visually understand what your users are finding attractive about your website and what they aren’t noticing at all. This way, you know what to change on your website and the aspects you can keep the same. At one point, you’ve probably wished that you could invisibly sit next to your users and watch them navigate through your website. While that will probably never be possible, you do get the next best thing with Hotjar. With Recordings, you can watch your users click, tap and their cursor movements as well. What this does is help to identify usability issues and you can fix these on the go. Plus, you can learn where navigational improvement opportunities exist and eliminate the guesswork involved. As you can see above in the example provided by Hotjar, you get to replay exactly what the users did, where they clicked and so on. When you’re analysing your own user behaviour, you’ll be able to see what users are doing, where their cursors are moving and where they might get stuck and use that data to make changes to your own website. How it Helps in GDD: With traditional web design, improvements can’t really be made until the complete redesign so you’d be waiting quite a while. With Hotjar and the GDD process, you can see every single user action rather that just assuming how they’re navigating through the website and the different pages. What you do with these recordings is fix the issues they encounter rather than ignoring it entirely. Not every single website is going to be perfect right off the bat, that’s why the continuous stage of the GDD process exists in the first place. It’s easy to try and do too much by working on too many sections of your website in one go. How it Helps in GDD: By creating funnels using Hotjar’s Conversion Funnel feature, you and your team can understand where your company is losing the most visitors by dropping off certain pages - which you can watch through recordings too. This is very beneficial to the GDD process as it’s a brilliant way to identify the biggest hurdles to conversions on your website. You can even discover new opportunities to improve the overall flow for visitors. Pretty much every website is going to have some sort of form on it for a user to fill out. However, not everyone knows how the forms are actually used as they don’t have the methods in place to analyse that data. How it Helps in GDD: Inbound Marketing almost always features lead cards. If you’re not getting the results you expected in your sales funnel, then Hotjar’s Form Analysis is a great tool to utilise in your GDD efforts. It helps you by discovering which fields are taking too long to fill out, the fields that are left blank and why your visitors are abandoning your forms in the first place. It’s one thing to know that you have data on user behaviour, but it’s another thing to actually understand their motivations behind the decisions they’re making on your website. Hotjar Polls is another useful feature that works hand in hand with what the GDD process is all about - getting data on user behaviour and making those impactful changes. This feature lets you ask visitors on your site an unlimited number of questions. It can be dependant on certain types of behaviour, too. For example, a poll might pop up when there’s a short delay where a user hasn’t navigated through the website or even when they’re about to leave. How it Helps in GDD: Again, it’s all about getting rid of that guesswork. Nobody knows your customers better than themselves. This basically gives you insight as to why visitors are on your site, why they’re leaving or why they’re converting. It’s a chance to learn what they’re looking for and this is invaluable when it comes to continuously improving your website. You need to understand what’s stopping users from achieving their purpose or solving their pain points. Having that feedback gives you actionable insight and puts you in a better position to make impactful and relevant changes - rather than always assuming. Linking in with the previous point, it’s vital that you’re getting the right type of feedback from users. Without this, your team might be wasting valuable time making improvements to an area where no changes are needed in the first place. With Hotjar, the Incoming Feedback feature gets you instant and visual feedback from visitors. By implementing this, you have the ability to remove the guesswork from improving your visitor experience. How it Helps in GDD: Once this feature is activated, you’re giving visitors an actual platform to give their thoughts rather than leaving disgruntled if their problems aren’t solved. It’s an easy way for users to leave instant visual feedback so you can see what they loved, hated and any other issues they had. As they can take a screenshot of a specific area of a page that they want to give feedback on, your team is in a much better position to get to work right on the elements they need to. So, they’re spending time improving the website in areas where it matters the most time and time again. One key difference which sets Hotjar apart from a similar tool, such as Lucky Orange, is that you’re able to send out an NPS survey - a Net Promoter Score - which is used to gauge the loyalty of your relationship with a customer through a regular survey. The NPS is a survey used to develop a deeper understanding of how valuable your users consider a particular tool - or even their overall experience on your website. It’s actually rather simple. An NPS asks your users to vote on a scale of 1-10 on a variety of questions. It can be anything from asking how helpful they found something on your website or how likely they are to recommend it to a friend, for example. How it Helps in GDD: Hotjar’s NPS survey lets you ask your users an unlimited number of questions. You can collect responses in real-time and - like the polls - you know exactly which areas you need to make changes to. If you set a benchmark score you’d like to achieve, then it gives you a better guideline of what you’re doing well and where you’re falling short on your website. 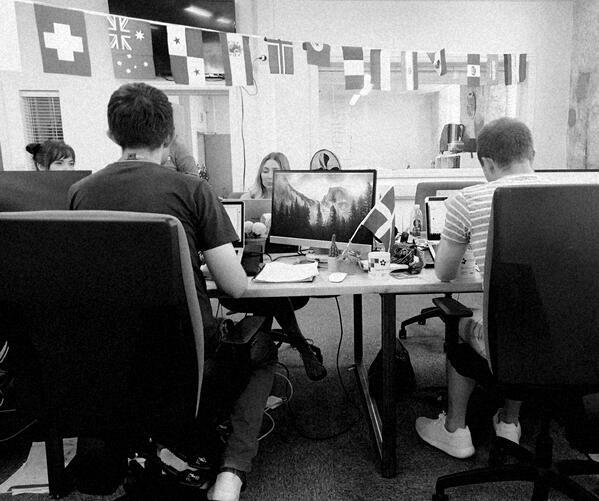 As we’ve mentioned earlier on in this post, there’s nothing more beneficial than working alongside your users so you know which impactful changes will help them solve their pain points. With Hotjar, you can spend that quality one-on-one time with them with their Recruiters feature. How it Helps in GDD: You’ll be able to recruit users that won’t give biased opinions when it comes to the usability of your website. They give honest views about what they like and dislike so you can take that data and make the relevant changes. In fact, you can even offer an incentive like a gift in exchange for their help. Overall, Hotjar has plenty of useful tools within the platform that all assist towards business growth. With your website being a big factor in your marketing efforts, it’s beneficial to implement a tool that specialises in helping to continuously improve your website. Having a useful tool like Hotjar is one of the first steps you can take towards having a successful Growth Driven Design journey. GDD is now seen as the smarter and newer approach to website design. While it can seem a daunting prospect to get involved in, it doesn’t need to be and the statistics are there to prove that it truly is the best way to drive optimal results for your new website as part of your Inbound Marketing strategy. To help you gain a much better understanding of GDD, information on other tools you can implement, how the process works and what you need to get started, we’ve created an in-depth helpful guide. Until that's ready, why not join our private Facebook Group?